There are times when you inherit something that really appeals to you but you don't quite know what to do with it. We were given two modern chairs by my in-laws several years ago and I just couldn't part with them, even though they sat in storage for awhile and were never used. These are mid-century modern chairs that go by many names such as, saucer, moon, dish and so on. I think it resembles a large shell or fan because of the way it is stiched in such a round shape. I saw one online for sale that was advertised as a "flying saucer" chair. I believe it! I think that name suits it well. It was the closest match I found for a chair like this. I couldn't use the image because of copyright restrictions. They have made a comeback and you can see them at Target for adults and as small chairs for children. I just think they are funky and fun and I wanted to display them but I wasn't sure how to because I like french farmhouse decor. These are made of leather and are quite large so they take up a bit of space, especially in a small house like ours and they swivel as well. I really like the turquoise one. I am sure they are valuable and perhaps rare because the research I did on them didn't pull up any exact matches. I know these chairs were common in the 50's and 60's. 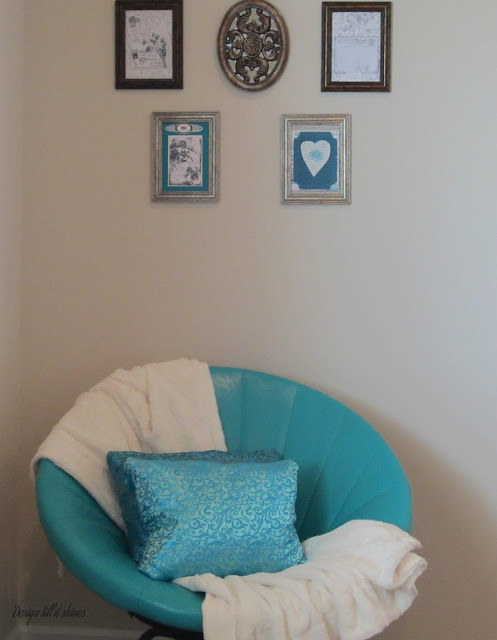 I decided to put the turquoise in one of the bedrooms and try and do something with it. This room has very few pictures on the walls, so I decided to work with what I had and made a small display of pics over the chair. 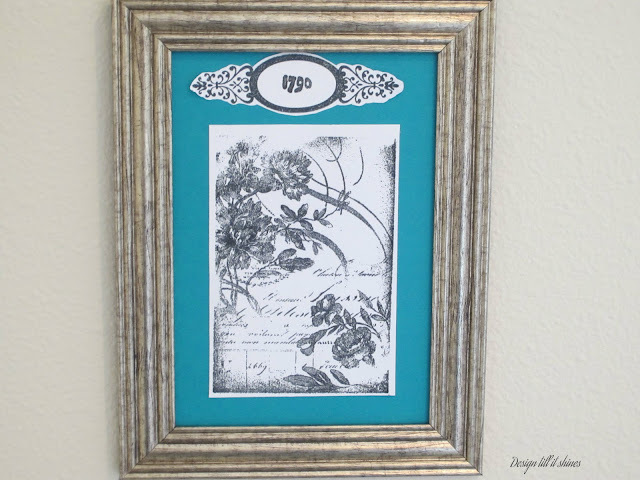 I used stamped cards in small frames. These pics are too small for this space, and get lost in this room but I will update them later. It's hard to know what to display over a chair like this anyway. I found some really pretty brocade fabric at Joanns that is reversible. I made some small pillows. Actually I wrapped some small pillows with the fabric and velcro because I don't sew. I really love how the pillows came out because they match the chair so well and the detail in the fabric looks very rich. 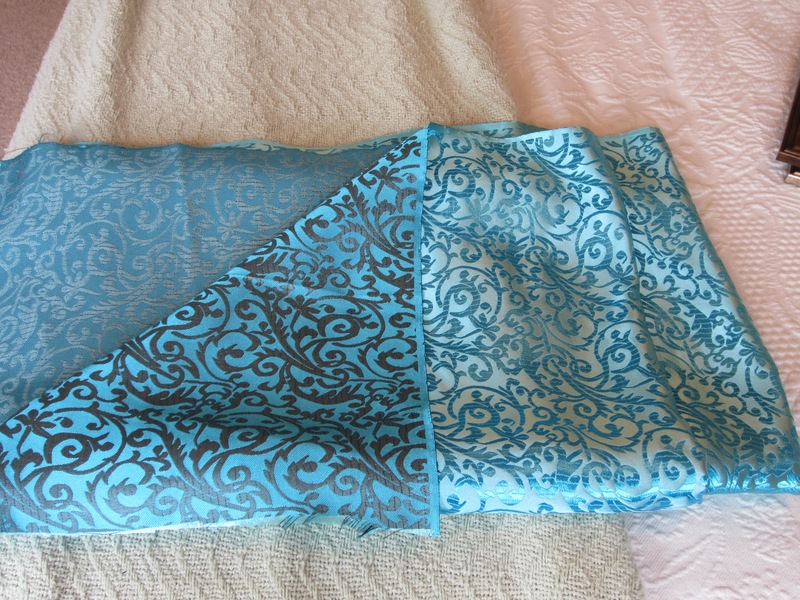 This is the reversible brocade fabric I found at Joanns. It turned out to be an almost perfect match for the chair. I love the pattern in this fabric as well. 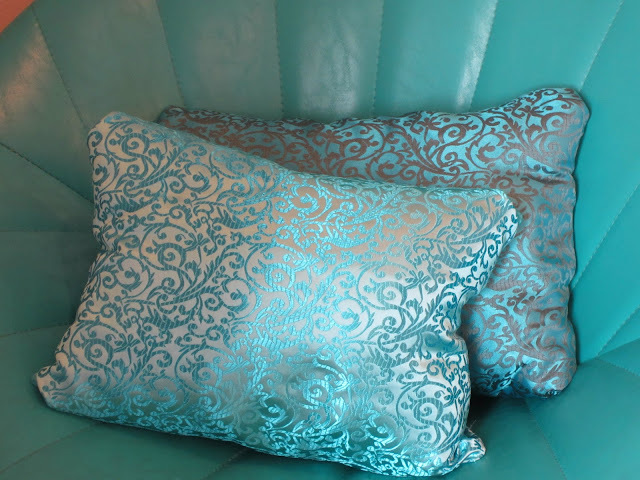 Here's a closeup of the pillows. I love the way the fabric shimmers. 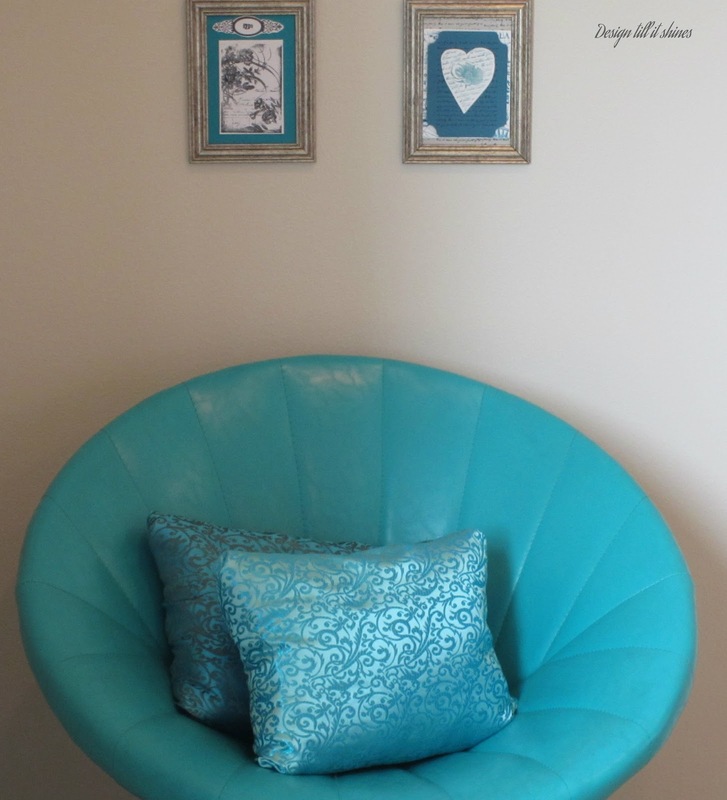 It brings a look of glam to this chair. I think this closeup makes it look like a clam shell that has opened up with goodies inside! The orange one is my problem chair. 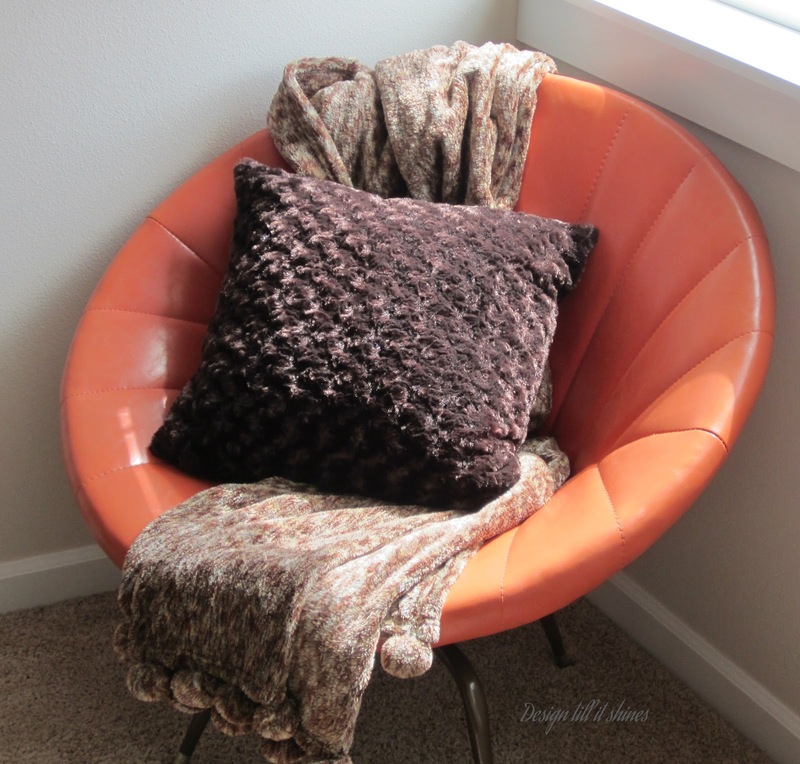 I don't like orange furniture and I think this chair looks kind of weird anyway, but I just can't let go of it. I remember my in-laws had these chairs in their rec room. The whole room looked like a 60's revival. 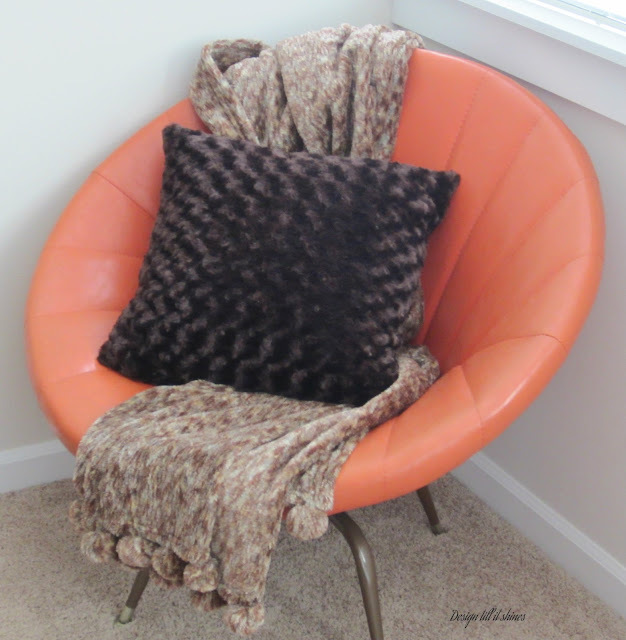 I added a pom pom throw and a faux fur pillow. The chair is in our loft now, which is our office really, so It doesn't look too bad in here. There isn't that much you can do with this color decorating wise. I think it will look better with an orange and brown floral pillow for fall. 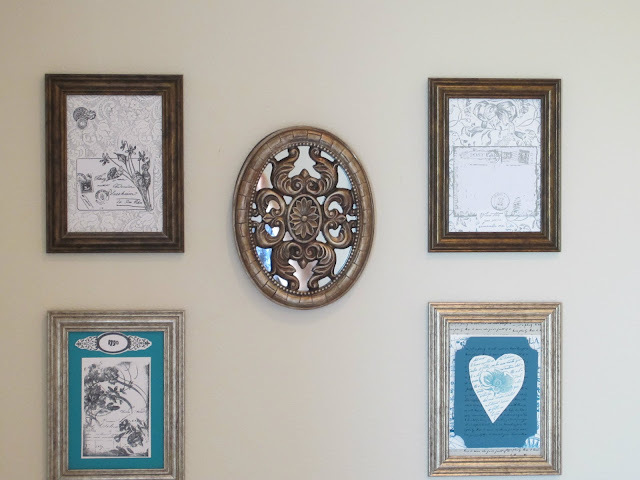 It's always fun to have something unusual in your home that makes your guests wonder, what is that? I think I'll try and decorate it for Halloween somehow. It is certainly scary enough! Back to the pretty chair again. I love the soft turquoise in this picture. Here are some closeups of the stamped cards in frames. 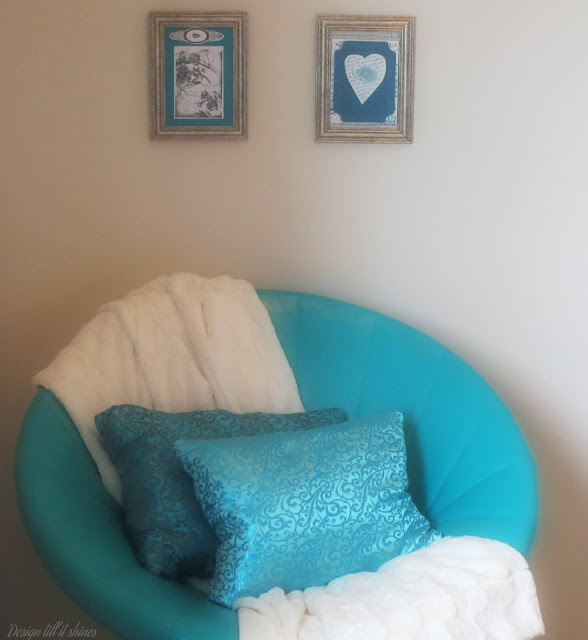 Another picture of the chair with a plush throw. I think this chair now looks somewhat 20's and 30's inspired with the pillows and the throw. 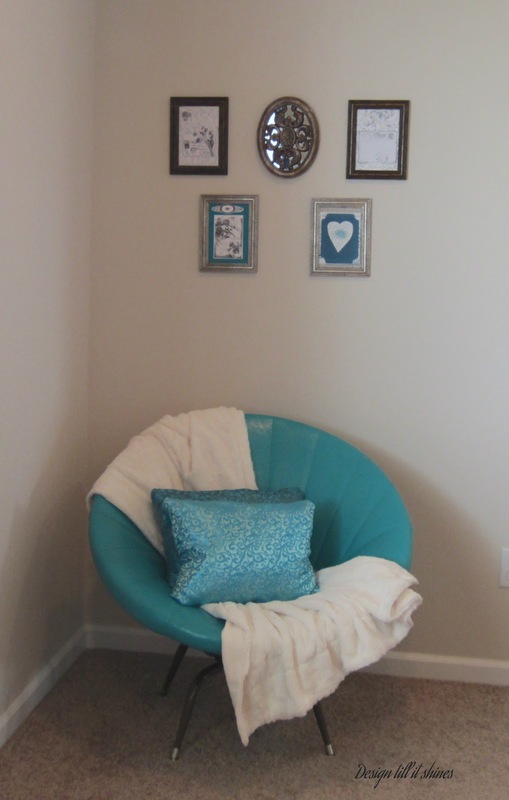 I think I'll add some art deco pics to the wall and add a little glam to the corner of this room! 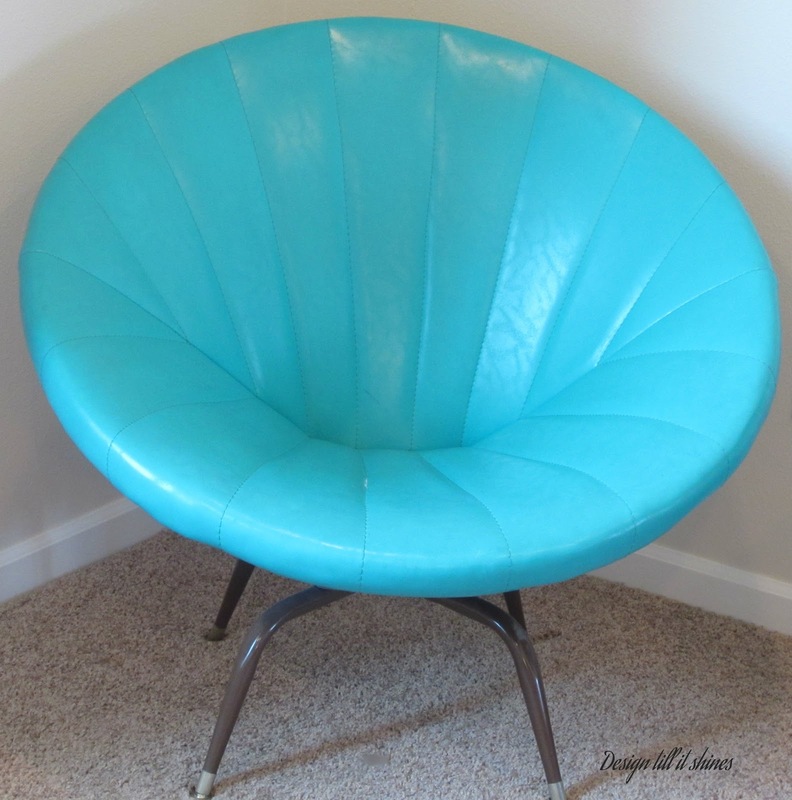 I have one of those old '60's round chairs, and just cannot let go of it either! How did you make a pattern for the fabric to recover the chair? Thanks for your comments and for following me. I didn't do anything to the chair itself. It is covered in the original turquoise leather. I just covered some pillows in fabric to accent the chair. If you have any pictures of your chair you would like to share I would enjoy seeing them. Also, if you have a blog let me know and I will follow you as well. I love both of those chairs! I think use them together in the same room and have turquoise pillows on the orange one and orange pillows on the turquoise chair. I think they are fabulous! I think that's a great idea to put both in the same room with contrasting pillows. I wish our rooms were larger so we could do that, but there just isn't enough space. We have a newer home with a small floor plan. I will do something different with the orange one though. You've given me some ideas. I'm not loving that throw and pillow I have on it. Thanks for your comments and for hosting. Visiting you from Ivy and Elephants WIW. Love your chairs. The turquoise one is my favorite. My mom had a white one in the living room when I was a kid, fun for twirling. The fabric you chose for the turquoise chair pillows is so pretty. I'll be following your blog. I am in the process of setting one up myself but am pretty slow when it comes to knowing how to do any of the "tech-ish" stuff needed for blogging. I still need to figure out exactly how I want to do photos on my blog, so I will be looking to your blog for inspiration. It's fun to have found someone just starting out with blogging. Thanks for your comments about my chairs and welcome to blogging. I know it takes a while to get started because there is so much to learn. I set up my blog myself and I still have a quite a ways to go before it is finally done. I just like learning new things even though it was a little overwhelming at first. I'm definitely not a techie either. I like the name of your blog and look forward to visiting you when you get set up. You can follow me if you'd like on google friends connect on my sidebar. I'll follow you back when you get set up. I'm going to add other link up sites as well in time. I don't know what photo editor you use but I use ipiccy because it makes it easy to get started and it's free. It is fun to connect with other new bloggers and share ideas. Good luck setting up your blog! 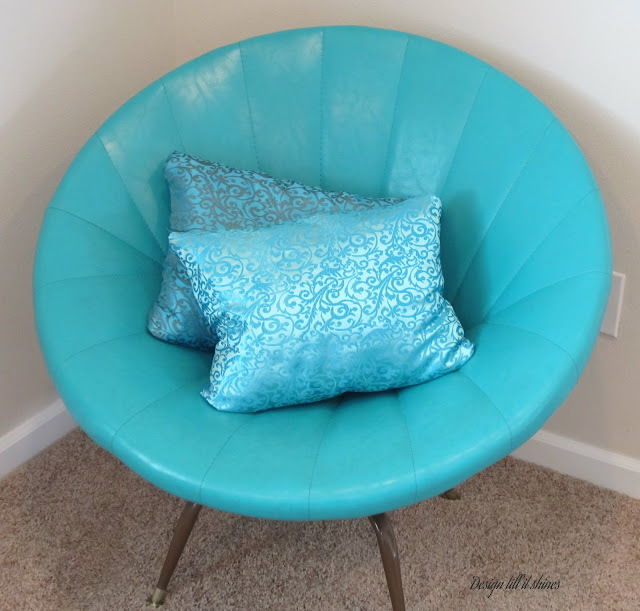 I featured your Mod Vintage chairs on Mod Mix Monday!